This champagne glass holds 7 oz. and features a novelty design for the stem. Perfect for luncheons, picnics, and themed parties. 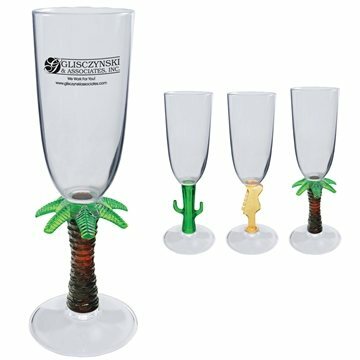 Personalize these glasses with your company name and logo to leave a lasting impression. Available in a wide variety of designs. Made out of durable NAS acrylic plastic. Quality product at an affordable price! Rosa was excellent with communicating important information. No problems. The color made it look more expensive than it really was. We plan on giving it to our staff for the first time this year. Exceeded my expectations Great item, very well received by customer.